Essence is really getting into nail art recently. They now have an entire line of glitters, decals, special nail art base & top coats and also these six Nail Art pens! Nail art can take up a lot of time, especially if you're into freehand stuff. Will these pens make your nail art life easier? 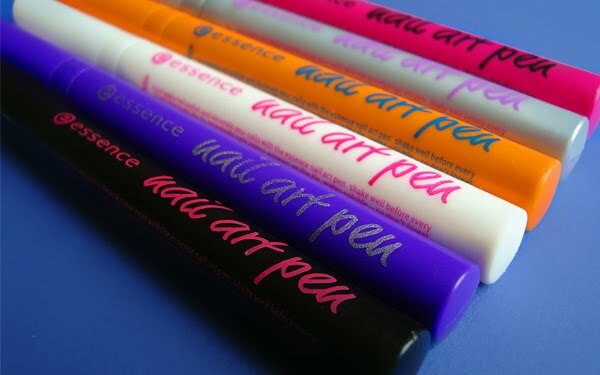 Essence came up with these pens in six different colors, the packaging actually reminds me a lot of markers. They're fairly easy to use. Give them a good shake, press on the tip until the polish comes out and you're all set. I played around with these and they're pretty neat when it comes to drawing, thanks to the pointy tip. I swatched the colors over black and white, to show you how they're holding up against a bold background. Cool Black is really awesome, it's very opaque and applies pretty nicely, allowing to make neat tight lines (which I obviously didn't - damn caffeine!). Silver Star is another winner, very opaque, easy to handle. Then we have Silver White, in the picture it looks nearly the same as Silver Star but it's not, I was expecting this to be a solid white, but I got a pearly sheer white instead, not a fan of this one. Next in line is Deep Purple, I love this color but it has an extremely watery texture, so it's almost if you're making a water-colour painting with this one. Same goes for Juicy Orange, sheer, watery, I don't like it. Last but not least we have Spacy Pink. Spacy pink looks a LOT lighter than its deceiving packaging, but because it's a very well pigmented color, I liked it nonetheless. Overall I'd say these are nice, but not perfect. I would recommend getting Cool Black, Silver Star and Spacy Pink and that's about it. And luckily those make up for a great color combination! You can also use top coat on these without smudging your lines, I was pleasantly surprised! I got these at Dutch drugstore Kruidvat and they were €1,99 each.